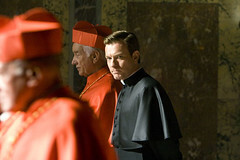 I recently watched Angels and Demons, the film adaptation of Dan Brown’s novel. 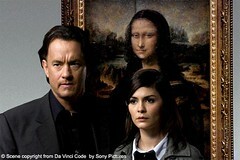 Like The Da Vinci Code, I was a bit underwhelmed, but only because I had thoroughly enjoyed the novels. And invariably, what your imagination invokes from words is a much more personally compelling endeavor than what someone else invokes from them. However, I still enjoyed watching the movies. It’s thrilling to actually see the cathedrals, statuary, works of art, and cryptic objects that the author describes in the books. Ron Howard provides his usual bland but workman directorial vision. He doesn’t have Spielberg’s ability to emotionally manipulate the audience. Nor does he have the ability to thrill the viewer like any number of action/thriller directors. Nowhere was I moved into any strong feeling about any character. But that’s alright. At least he entertains. Tom Hanks kind of mails it in, but still manages to delivers a fine performance. The female lead was remarkably uncharismatic and had zero chemistry with Hanks, which was surreal. In the novel, there was a lot of romantic tension between these two characters. They should have casted Megan Fox and called it a day. 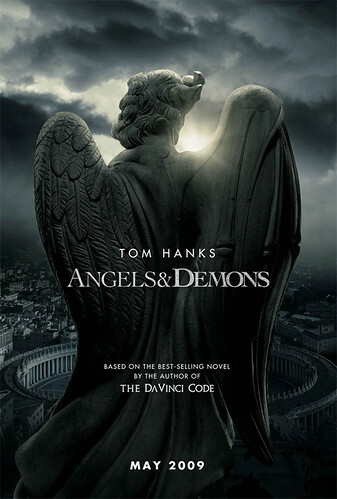 Angels and Demons was billed as the sequel to The Da Vinci Code, but actually, the novels were written as the other way around. I’ve read all four of Dan Brown’s novels, including Digital Fortress and Deception Point. By the time I read the third of these novels, I was able to predict the plot. All four have the following elements. •	Middle-aged academic who is obsessed with some obscure specialization. 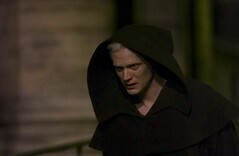 In Angels and DaVinci, he’s the main character. In Digital and Deception, he’s more of a supporting character. •	A tough cop appears to be a bad guy, but has been manipulated by some sinister shadow figure. •	A cold-blooded assassin. He runs amok and tries to kill the protagonists. He kills a lot of other people during the proceedings. They have some element of freakishness or weirdness about them. There’s an albino assassin, a deaf assassin, a member of an ancient order of assassins, and there’s also a Delta force squad. •	There are many secrets and cryptographic mysteries to puzzle over. •	And finally, the shocking twist (but so very predictable) is that the most helpful benefactor of the protagonists is revealed to be the main bad guy. Once I gleaned these patterns, I was able to predict the ending. Nevertheless, I still am a big fan of Dan Brown because the stories are well researched, the twists are meticulously plotted, and the guilty pleasure of reading low-brow pulp fiction is expertly painted over with quasi-scholarly conspiracy theories. How’s that for a left-handed compliment. actually, his fifth novel is coming out this september! i’m curious to see if he uses the same formula. hopefully, he’ll make it a little more unpredictable. I think most people liked “Angels and Demons” better. Have you checked “Frost/Nixon”? It’s one hell of a movie directed by Ron Howard. It’s almost hard to believe it’s the same director. But hey he made great stuff in the past such as “Apollo 13” and “A Beautiful Mind”. But you’re right, it’s mostly entertaining. man, i forgot about those movies. those are great films. but i don’t remember being moved to tears in those. i could be wrong. i’ll need to watch those again. Many years ago, before the Da Vinci Code came out as a novel, I read a lot of books about the Holy Grail and the Templars, who seemed like quite a formidable group. 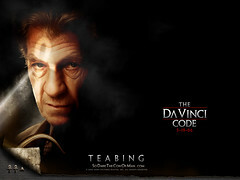 I’ve never read or watched the Da Vinci Code. I always figured it would be too contrived, with outcomes biased against the Catholic Church. Here in Nova Scotia, there’s a real unsolved mystery on Oak Island involving a buried treasure (or secret) of sorts called the Money Pit. It’s been linked to the Templars, the Holy Grail and Rosslyn. There are lots of theories as to what is buried deep in a hole there: the Holy Grail, secrets of the Catholic Church, Templar gold and treasure… Many men have lost their lives and millions have been spent in an effort to figure it out. so glad you enjoyed them. i like the story of the money pit. maybe dan brown’s next book?